The first book by the creator of COURSERA®'s most popular online course in 2015, "A Life of Happiness and Fulfillment"
Could the same traits that drive your career success also be keeping you from being happier? Fifteen years after getting his MBA, Raj Raghunathan spent some time with his old classmates. He noticed that though they’d all done well, there didn’t appear to be much correlation between their academic success and career success. What Raj found even more curious was the even smaller correlation between career success and what he calls life success. The greater the career success, the more unhappy, out of shape, harried and distracted his friends were. If intelligence helps with decision-making, smart people should naturally make better life choices. So why are so many of the smartest, brightest, most successful people profoundly unhappy? Raj set out to find an answer to this problem, and extensively researched happiness not just of students and business people, but also stay-at-home-parents, lawyers, and artists, among others. 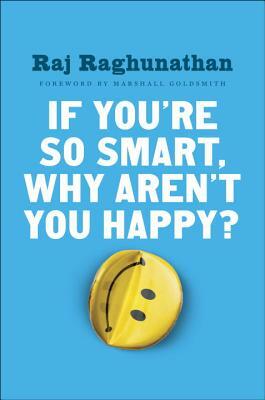 If You’re So Smart, Why Aren’t You Happy? will give you a powerful new perspective on your work, personal goals and relationships, whether you’re already successful or just starting out. Raj Raghunathan, Ph.D., is Professor at the University of Texas McCombs School of Business, where he relies on themes from psychology, behavioral sciences, decision theory and marketing to explain consumption behavior. He serves on the editorial board of Journal of Consumer Research, Journal of Marketing, and Journal of Consumer Psychology. He is also one of the fourteen faculty members of Whole Foods founder John Mackey's Academy of Conscious Leadership. This book is a landmark contribution to the burgeoning literature on leading fuller, happier, more fulfilling lives. With a scholar’s sensibility, Raj brilliantly marshalls extensive research evidence that supports his simple yet profound prescriptions for better living. I have no doubt that this book will come to be regarded as a classic in the field; it will help change countless lives for the better, as Raj’s online course is already doing. “Tell a man a joke and he’ll be happy for a moment. Give a man Raj's book, and he’ll be happy forever! While you are at it, get yourself a copy of this excellent, well-researched book. It will make you smarter and happier. "A compelling and highly profitable read. Get this book, mark it up with highlighters and practice, practice, practice. Your life WILL improve." -Srikumar Rao, author of Happiness at Work, TED speaker and consultant. "This is an empirically-grounded, practical, and fun-to-read book that will help you get the most out of your life and find the happiness you really want. A must-read for anyone searching for the true meaning of success." Raghunathan gives you the tools you need to lead a more satisfying life. He roots his recommendations in good science, and then provides a wonderful set of tools to put you on the path to long-term path to happiness. Better still, even reading this book is a joy. "How important do I think it is for you to read this book? Let me just say that if you are smart and successful and yet feel that you aren’t as happy as you could—or want to—be, I wouldn’t just recommend that you read this book. I would say that you owe it to yourself to drop everything else you are doing and start reading the book now!"